MUMBAI: In what is shaping up into a mega-deal between two corporate behemoths, Saudi Aramco, the world’s most profitable company in history, is learned to be in “serious discussions” to acquire up to 25% in the refining and petrochemicals businesses of Reliance Industries Ltd, India’s largest company. While Saudi Aramco, which is also the world’s largest oil exporter, is known to have first shown interest in Reliance about four months ago, talks gathered momentum following the visit of Saudi crown prince Mohammed bin Salman (MBS) to India in February, during which he met RIL chairman and India’s richest man, Mukesh Ambani. There might be an agreement on valuation around June this year, people with knowledge of the development said. 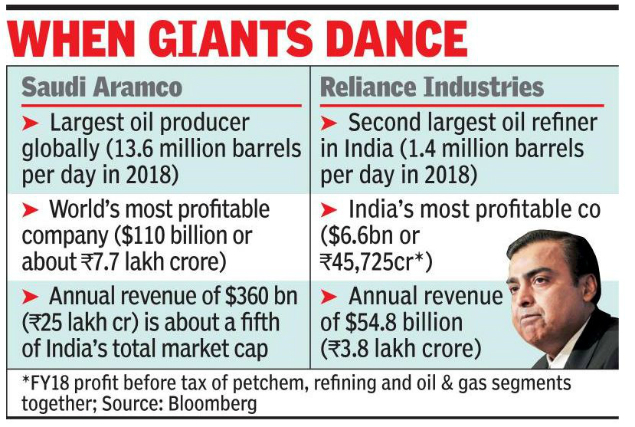 A minority stake sale could fetch around $10-15 billion, valuing RIL’s refining and petrochemicals businesses at around $55-60 billion. At Tuesday’s share price, RIL has a market capitalisation topping $122 billion (or Rs 8.5 lakh crore). Goldman Sachs, the storied investment banker, is said to have been mandated to advise on the proposed deal. 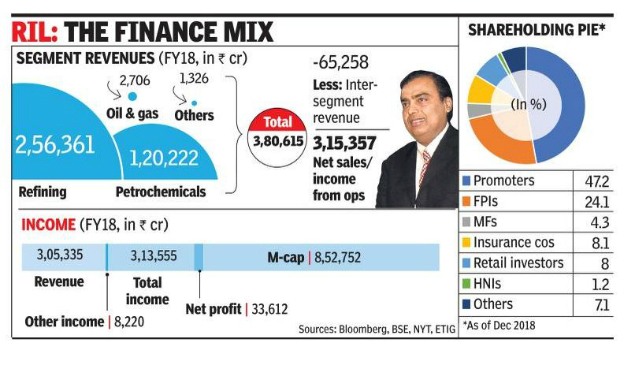 “RIL has grown too big – from energy to retail to telecom. It needs to compartmentalise. It makes sense to spin off some of its verticals. It’ll help raise funds and unlock shareholder value,” said a highly placed person in the financial sector who didn’t wish to be quoted since he didn’t have direct knowledge of the matter. RIL has financed Reliance Jio’s high-voltage entry into telecom even as gross debt soared to about Rs 3 lakh crore. Deleveraging would also allow Jio to pursue its aggressive expansion plans, according to corporate finance specialists. “It’s sensible market policy,” said one of them. TOI has in the past reported about share sale plans in telecom infra and retail. “But Jio is still some way away from being spun off, it’ll take more time,” said a source. It was after he attended Mukesh Ambani’s daughter Isha’s pre-wedding festivities in Udaipur in December that Saudi oil minister Khalid al-Falih publicly signalled Aramco’s interest in forming joint ventures, including with RIL, to expand India’s refining capacity, which is currently straining at around 4.6 bpd. Domestic crude oil consumption is expected to more than double to 10 million bpd by the year 2040. “As a policy, we do not comment on media speculation and rumours. Our company evaluates various opportunities on an ongoing basis,” said an RIL spokesperson in response to emailed queries. A Saudi Aramco spokesperson said he would respond at the earliest, but had not reverted till the time of going to press. Earlier this month, Aramco reported a $111 billion profit on revenues of $360 billion in 2018, dethroning iPhone maker Apple Inc as the world’s most profitable company, according to global media. Aramco recently opened up its finances to rating agencies as it raised $12 billion through a bond issue, investor interest in which turned out to be 10 times the amount on offer. With its sights set on a jaw-dropping valuation of $2 trillion, Aramco — which is geologically blessed with huge hydrocarbon reserves and low cost production — tested the waters to raise $100 billion in an overseas IPO about 18 months ago, but subsequently rolled back its plans.